Survey Archives | TOUT WARS! Tout Daily Picks for June 5! Who Will They Feature. We asked the Touts to share their picks for best pitcher and best hitter tonight’s Tout Daily Week 9 contest. You can follow the results here tonight. For more about Tout Daily visit here. Tonight’s contest is Week 1 of Phase 3 of the five phase contest. The top three finishers in each phase get a ticket to the big August 28 final, with big money and the chance to be the first Tout Wars Daily champ. 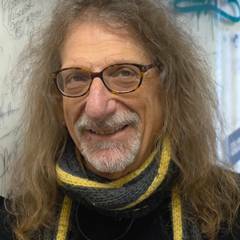 Scott Pianowski, Jeff Erickson, Adam Ronis, Lenny Melnick, Lawr Michaels and Tom Kessenich have tickets to the finals already. The leaderboard is here. Here are this week’s Tout picks. I’ll be updating this as they come in, so check back later if you get a chance. Paul Goldschmidt ($5,500–New York Mets at Arizona Diamondbacks) I really wanted to go here with Giancarlo Stanton, but there is a 45% chance of rain tonight at Colorado, paired with a late game start, and I can’t take that big of a risk. Instead, I will go with Paul Goldschmidt and pay up on the premium that I saved by starting Brett Anderson as my starting pitcher. Goldschmidt is on a tear and over the last 7 days, he has a .480 batting average, 4 home runs, 7 RBIs, and 7 runs scored. He is at home and faces a weak Met’s pitcher in Jonathon Niese. If you are looking for a value pick, then start Jose Abreu ($3,700) at home versus Detroit’s Kyle Ryan. Jake Odorizzi ($8,600–Tampa Bay Rays at Seattle Mariners) This is a tough pitcher’s slate, as none of the aces are going and most of the best alternatives are on the road. I’ll use Odorizzi against a Mariners lineup that has really scuffled this week, and hope that he gets better run support than he has in most of his outings. I was tempted to go with Tim Lincecum against the Phillies, but he’s on the road and only $100 cheaper. Joey Butler ($3,000–Tampa Bay Rays at Seattle Mariners) While he is no longer a bargain basement guy, Butler remains cheap enough to be an automatic start against left-handers, allowing me to invest in an expensive hitter like Giancarlo Stanton in Coors Field (currently only at 51% chance of rain – that’s almost a sunny forecast!). Edinson Volquez ($8,400–Texas Rangers at Kansas City Royals) On a slate where Jake Odorizzi is the safest option, you may as well swing for the fences. The Royals are the biggest favorite on the board and the run total is among the lowest on the ledger. Volquez has strikeout upside though the Rangers are average in terms of strikeouts versus right-handers. Paul Goldschmidt ($5,500–New York Mets at Arizona Diamondbacks) You’re not going to need to spend on an arm so you can go for a top bat and it doesn’t get any better than Goldie facing Jon Niese. Niese has allowed at least four runs in each of his last four outings, serving up a least one homer in each (eight for the season in just 57 frames). Michael Cuddyer ($2,700–New York Mets at Arizona Diamondbacks) Inside Edge says high output/low salary tonight against Jeremy Hellickson. Williams Perez ($5,800–Pittsburgh Pirates at Atlanta Braves) With no stud starters tonight, IE says Perez is the second-best choice on the board. And he costs $100 more than Bryce Harper. Aaron Sanchez ($6,800–Houston Astros at Toronto Blue Jays) In a day of generally crappy pitching, I am buying as low as is reasonable with Sanchez, figuring he can whiff some swing happy Astros and hang on for six decent innings. Avasail Garcia ($2,500–Detroit Tigers at Chicago White Sox) Again, somewhat under the radar, but he kicks it against lefties and I think Kyle Ryan makes an appropriate victim. DPed and Hanley look equally tasty versus the struggling Kazmir. Jake Odorizzi ($8,600–Tampa Bay Rays at Seattle Mariners) In the past, I may have emphasized the Odorizzi’s splitter negates the platoon advantage well, so the lefties in Seattle’s lineup might be neutralized, leaving one big righty to get past. But even with Mark Trumbo in the mix, Odorizzi won’t worry too much about this matchup. The new hybrid cutter/slider — yes, it’s a slutter — gives him a weapon against righties that he was missing. Odorizzi is a top pitcher in a good park against a meh lineup, and he’s not one of the two most expensive pitchers on a tough day for pitching. Giddyap. Paul Goldschmidt ($5,500–New York Mets at Arizona Diamondbacks) Sometimes, the big boys are worth the money. Both Paul Goldschmidt and Miguel Cabrera have the platoon advantage (against Jon Niese and Jose Quintana, respectively) in nice parks tonight (Arizona and Chicago respectively), but it’s Goldschmidt that has rocked curveballs most of his career (judging by FanGraphs’ pitch type weights, while Cabrera’s work against them has been more modest. Add in the fact that Goldschmidt is at home, and all batters fare better in their home environs, and he seems like today’s rock solid pick. Jake Odorizzi ($8,600–Tampa Bay Rays at Seattle Mariners) I’m betting a lot of people go cheap on pitching with the generally weak options on Friday. Odorizzi, who just held the Mariners to one earned run and fanned seven in seven innings last week, is well worth the $8,600. Paul Goldschmidt ($5,500–New York Mets at Arizona Diamondbacks) This doesn’t really require an explanation, but any time one of the best hitters in the league is also one of the hottest hitters, he needs to be in your lineup. Wade Miley ($7,000–Oakland Athletics at Boston Red Sox) On a day with no “safe” options for the mound, you can turn it around and look and see which risky pitcher has the best matchup. At BaseballHQ, we have a tool called Pure Quality Starts that rates each SP outing on a scale of 0-5. Among tonight’s matchups, the “softest” for any scheduled starter is Wade Miley ($7000) against the A’s: against LHPs on the road, the A’s offense has allowed opposing pitchers to post an average PQS score of 4.0 (i.e. a very good outing). Put another way, the A’s have a .625 OPS against lefties (.739 vR), and a .698 OPS on the road (.724 at home). Miley gets the better end of both of those splits tonight. Wil Venable ($2,400–San Diego Padres at Cincinnati Reds) A dearth of top-end pitching tonight means that hitting options will be abundant. Even with a cheap pitcher like Miley, a cheap hitter or two can really open up some options in the rest of your lineup. A favorite budget-hitter of mine tonight is Wil Venable who checks every box you want: he’s batting leadoff, with the platoon advantage, against a shaky SP in Raisel Iglesias, in a hitter-friendly balllpark. I’ll take that every night. Tsuyoshi Wada ($6,700–Chicago Cubs at Washington Nationals) has been striking guys out since his return from the DL but has yet to score a win. This is a rematch of a Chicago game 10 days ago that Tanner Roark won 2-1, and the Nats have struggled to score runs since. Ks, cheapness, and a chance to win make Wada a good bet on a tough night for pitching picks. Charlie Blackmon ($4,000–Miami Marlins at Colorado Rockies) has the platoon advantage in Colorado. Nuff said! Unless it rains too much. Jake Odorizzi ($8,600–Tampa Bay Rays at Seattle Mariners) He’s not been quite as good on the road, but Seattle ranks 24th in the Majors in runs scored at home. On a day like today, there’s something to be said for safety, even in a tournament. Jose Abreu ($3,700–Detroit Tigers at Chicago White Sox) Abreu is a .331 career hitter vs. LHP. Kyle Ryan has had 4.00-plus ERAs in three of his five minor league seasons. The Cell is a great hitter’s park. I’m taking Abreu at a reduced price and will spend it elsewhere. Jake Odorizzi ($8,600–Tampa Bay Rays at Seattle Mariners) Not a single pitcher tonight over $10K means, find the best option. Tonight, I’m rolling with Jake Ordorizzi against the Seattle Mariners. The Mariners are losers of five straight and are averaging seven strikeouts per game over those five loses. I’m going to take the points here with Ordorizzi and hope the Rays stay hot, winners of four out of their last five games. Dustin Pedroia ($3,200–Oakland A’s at Boston RedSox) is hitting 87 points better at home (.351/.264) than on the road. He’s also facing a lefty in Scott Kazmir who he’s enjoyed tremendous success against in his career (.475). Since May 21 Pedroia is batting .380 with three homers. Williams Perez ($5,800–Pittsburgh Pirates at Atlanta Braves) Lots of bad pitching bets, lots of dynamite hitter matchups, I’m going to roll the dice and let the chips fall with Williams Perez on the hill. Troy Tulowitzki ($4,800–Miami Marlins at Colorado Rockies) For hitters, there might be five who pop two HRs and one of the better bets to do that is Tulo. Billy Hamilton ($3,300–San Diego Padres @ Cincinnati Reds) and Brandon Phillips ($3,300–San Diego Padres @ Cincinnati Reds) As good as Tyson Ross is, he’s far and away the biggest stolen-base giveaway in the league. Someone is running in Cincinnati tonight. Jake Odorizzi ($8,600–Tampa Bay Rays at Seattle Mariners) Consistency is one of the most underrated aspects of a pitcher’s profile. Odorizzi hasn’t had a blowup start yet, and he’s worked six innings or more in every turn. Williams Perez ($5,800–Pittsburgh Pirates at Atlanta Braves) Long shot time! There’s no pitcher I really like tonight, so I’d rather spend my money on hitters. Perez is coming off a good last outing vs the Giants, has averaged almost a strike per inning, and I’m projecting his home start against Pittsburgh should produce 14 points. Josh Donaldson ($4,900–Houston Astros at Toronto Blue Jays) Big money going on Toronto’s 3B Donaldson, who has 6 HRs in his last 8 games, 4 in his last three in the Rogers Centre. Hopefully he takes Houston starter Roberto Hernandez deep tonight in what should be a high scoring affair North of the border. I’m also targeting Miami hitters against Eddie Butler at Colorado. Butler has an over 5 ERA at night at home, with left-handed hitters raking .333 against him. Jake Odorizzi ($8,600–Tampa Bay Rays at Seattle Mariners) has had no disastrous starts this year and a number of very good to excellent starts. Pitching Seattle makes him a safe choice with good upside. Yasmany Tomas ($3,000–New York Mets at Arizona Diamondbacks) hasn’t hit for much power, but he has hit. He gets a struggling and perhaps injured Jon Niese in a very good hitters park. Jake Odorizzi ($8,600–Tampa Bay Rays at Seattle Mariners) You can throw the names of the top half dozen options in a hat and pick one this week, but I’ll go with Odorizzi. His K/9 is lower than some of the other options I considered (Martinez, Ross, Kazmir), but I’ll go with him because he’s facing a strikeout-prone, offensively-challenged team that becomes even more so with the addition of the newly-acquired Mark Trumbo to that lineup. Eric Hosmer ($3,500–Texas Rangers at Kansas City Royals) Based on a cursory glance at historical results from this weekly contest, it appears that RBIs may be the hitting category with the strongest correlation with overall hitter points. So, I’ll go with a middle-of-the-order bat who should get several RBI opportunities as his team squares off against Texas rookie Chi Chi Gonzalez. Tyson Ross ($9,000–San Diego Padres at Cincinnati Reds) has a great matchup Friday night against Cincinnati. In 25 career innings against them, the Padres starter allowed just two runs on 12 hits for an ERA of 0.72. Reds batters have managed a collective .145 batting average against him. Brandon Belt ($3,600–San Francisco Giants at Philadelphia Phillies) has never faced pitcher Jerome Williams, but last month in his seven starts, hitters smoked the Phillies right-hander to the tune of a 6.62 ERA. This season, Belt has seven home runs, 22 RBI and a .994 OPS against right-handed pitching, so what could possibly go wrong for Williams? 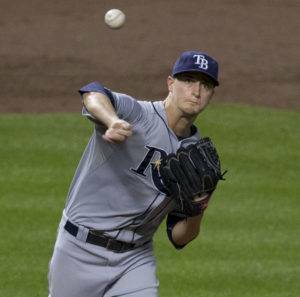 Jake Odorizzi ($8600–Tampa Bay Rays at Seattle Mariners) Odorizzi seems to have gotten past his control and long ball issues, and with an 11.2 percent whiff rate, he has some strikeout potential that hasn’t been fully tapped this season. Even with Mark Trumbo, the Mariners lineup represents a good matchup and Safeco Field is a favorable venue. Justin Upton ($4000–San Diego Padres at Cincinnati Reds) With Upton facing Jon Moscot in his major league debut, it’s hard to find a more enticing hitter. Moscot is a contact pitcher with flyball tendencies who will be toiling in the Reds’ bandbox of a ballpark. Upton is slugging .510 against flyball pitchers this season, which is not far above his .487 career mark against flyballers. As Tony Robbins likes to say, “Yumbo!”. Jake Odorizzi ($8,600–Tampa Bay Rays at Seattle Mariners) Pitching is tough today because there just aren’t any HIGH caliber names. There are some solid ones like Odorizzi, but no unquestioned studs. I think Odorizzi is a solid option. He has a pretty high floor as he hasn’t allowed more than 4 ER in any outing this year. His Ks has dipped from last year, but the results are much better (4.13 to 2.61 ERA) so it’s been a worthy trade-off. The Ms have some punch in their lineup, but they are in the bottom 10 of wRC+ v. righties this year. Preston Tucker ($2,900–Houston Astros at Toronto Blue Jays) Aaron Sanchez has a 1.013 OPS lefties with a 12% K rate and 17% BB rate. Tucker has emerged into the three-hole of that lineup, too, and they’re headed to Rogers Centre. Best part is that Tucker hasn’t really shown a platoon split in either of the last two seasons so he’s not even super susceptible to lefty RPs later in the game.